Share some expert advice and earn $50! Imagine a writing world without the need for a pencil or paper. What would writing be like if it were similar to using Siri on the iPhone? It would completely change the way writing is taught and executed. This infographic sheds light on the differences between using pencil to paper versus speech-to-text software. This is a first of its kind, thought provoking infographic that we hope challenges our standard way of thinking and doing. Where do you believe the future of writing is headed? Welcome back to the beginning of the year! Back-to-school. What does this word mean to you? For me, it was a time of excitement, chaos, and organization. Heading back-to-school after the summer months was always a transition. It took me a little while to settle in with my new students and get my brain back into “school” mode again (I’m sure true for the students as well?). These “Welcome to WriteSteps” videos are a great way to teach your students what they will be learning with WriteSteps. Submit a 5-minute video sharing a teaching tip and earn $50! Whether you’re using WriteSteps or not, we would like to hear from you! 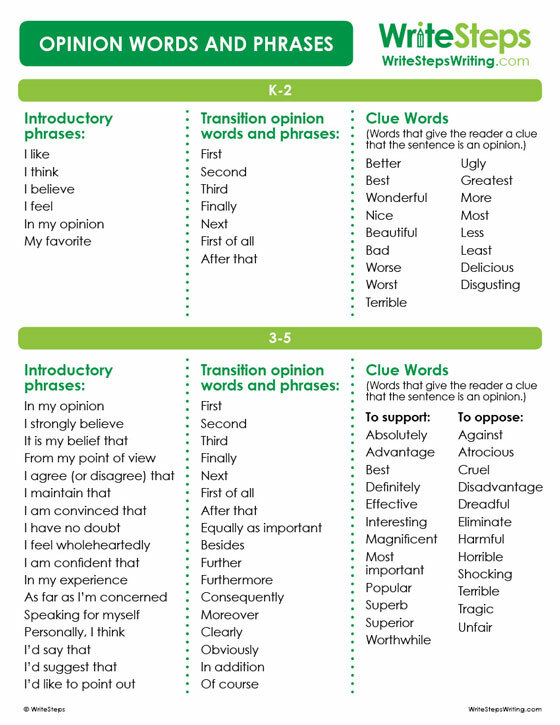 This poster lists opinion words and phrases that your students can use as a reference when they’re working on an opinion writing piece. Kim Gates will be presenting, “7 Keys That Inspire Success in Common Core Writing,” to attendees at the New England Reading Association Conference. Be sure to come to her presentation and receive valuable tools that can help you with your Common Core writing instruction.